The NAG LAN will be held at the Ticketpro Dome in Northgate Johannesburg from Friday 27 September at 09h00 to Sunday 29 September at 15h00. Yes, but you may not bring more than one gaming device per LAN ticket. Each additional gaming device you bring will require its own NAG LAN ticket. Thus if you want to bring your laptop/PC AND your Xbox/PlayStation, you require two LAN tickets. The LAN power requires the use of dedicated power outlets, “red plug”, to conform to legal requirements for the event. Therefore please ensure that each gaming device that requires power conforms to our standard power requirements. 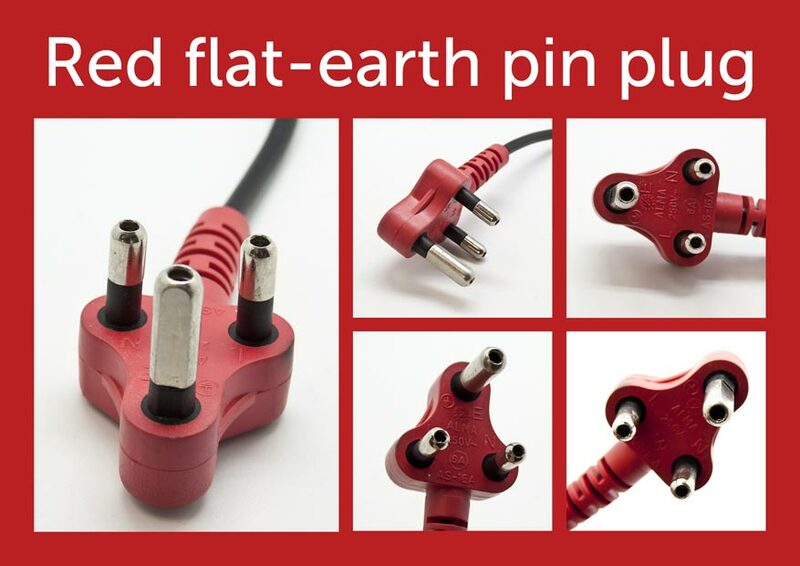 This picture shows what the red plug with the flattened earth pin looks like. Without this red plug type you will NOT be able to plug into the power grid. These plugs can be purchased from most large hardware and computer stores for about R20 if you fit the plug yourself, or R70/R80 for the complete dedicated PC power cord. Please do not wire the plug yourself if you are not competent to do so, rather get someone to assist you at the hardware store. 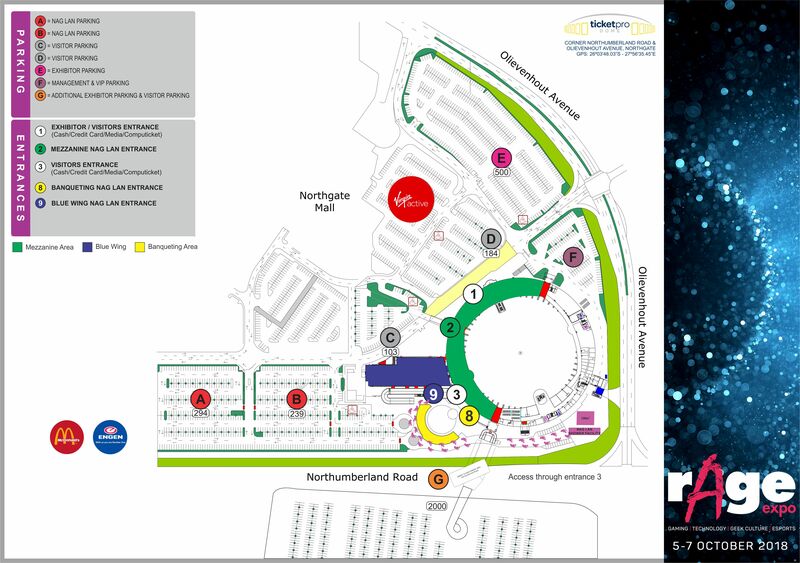 All NAG LAN ticket holders are to make use of parking block A/B, so make sure you check the location on the Precinct Map to make sure you know where to go. Upon arrival you will be given a parking ticket, and will be required to write down your car registration details on this ticket. It is important that this parking ticket is always displayed in your car window. Only people with a valid NAG LAN ticket will be granted access to parking block A/B. Please note that parking bays are available on a first come first serve basis. Please do not park in the incorrect parking block as the walk to get to the LAN entrance is going to be long, hot and tiring! No, rAge is a family event so all ages are welcome to attend the LAN. We do recommend though that very young gamers are supervised/accompanied by a responsible adult/parent. If you are under the age of 18, please ensure that you bring a letter of consent from your parents/guardian stating that a medic can treat you in the event of an emergency or accident. Please include your parents’ contact details on the letter so that we can phone them if the need arises. Do I need to bring my ID/Drivers License with? While there’s loads for under-18’s to see and do at the expo, there are some games, activities, and areas that are open only to over-18’s. So please ensure you bring some form of identification with you (ID, passport, or driver’s licence) to ensure that your rAge experience is hassle-free. Failing to produce proof of age may restrict your access to certain areas. Yes, any game that you want to play will need to be installed on your computer, laptop or console. Free to play games that are available can obviously be downloaded from the Internet, it is however suggested that you have all your games fully installed and updated before coming to the LAN. Basically any game that you and your LAN buddies would like to play that does not cause a non-willing participant any harm. Any communities that want to organize their own competitions for a specific game can do so in the NAG discord channel with all the info and links included so that the community can sign up and get involved. Do keep in mind though that there will be no trips to Sun City, Okavango Swamps or Zanzibar to be won. We will try and assist where possible to get some smaller prizes and giveaways for these competitions, but we can’t guarantee anything. If a formal competition is held in the LAN, news and information is usually published on the NAG website or NAG Facebook page. You will need a PC/console/laptop, monitor (27” is the largest we allow), keyboard/gamepad, mouse, headphones, and a power cord for your gaming device and monitor. Please note that your power cord for any of your gaming devices must have a red plug with the flattened earth pin. Without this red plug type you will not be able to plug into the power grid. Also note that you may not charge your cellphone from a normal power outlet, so bring the phone fully charged with a spare battery or allow for a USB charger that can be plugged into your gaming device. No speakers. No UPS’s. No multiplugs. No double adaptors or two-pin adaptors. No switches or hubs. No additional devices requiring power for example fans, cell phone chargers, etc. No drugs. No alcohol. Not more than one device per LAN ticket. No food or drinks may be brought into the venue. No smoking in the venue. No monitors larger than 27”. Yes of course. The only thing we do not allow is sponsor banners and advertising to be erected anywhere in the LAN. The LAN is sponsored by our partners and they reserve full and exclusive rights to all branding within the LAN area. There aren’t dedicated sleeping areas but you may bring your mattress/pillow/sleeping bag with you and catch forty winks at or nearby to your table. You will not be able to reserve specific seating when you purchase your LAN ticket at Computicket. Is the LAN in one big area or in separate areas? All NAG LAN wristbands will be colour coded to each area. Please note that you will have access to all three LAN areas if you have a NAG LAN wristband, so you don’t need to worry if you and your friends are in different areas and you want to go visit them.  Access to the rAge Expo show floor from all three LAN areas is easy provided you are wearing your NAG LAN wristband. Patches required for most of the popular games will be available on one of the servers. We will however limit the available bandwidth from this server, so that somebody does not decide to grab 6GBs of patches from the server, compromising the availability to other players. Note however that most of the newer games patch themselves automatically. So if you plan to play a game that has accumulated some dust, start it up at home in the weeks leading up to the LAN and update it to the latest version. This will ensure that you have time to fix issues that may arise due to updates, and ultimately ensure maximum gaming fun/time at the LAN. Most of the games that are being played these days require connection to servers being managed by the developers and hosted on the Internet. They control piracy, updates and cheating through this mechanism. Due to this strategy very few games have dedicated servers available for local hosting. Since our Internet connection is awesome (thanks Mweb Fibre! ), we no longer focus on hosting local servers. So use the normal in-game browser or similar utilities that you would at home to monitor game server availability. Please do not use scanning software since this is a big no no. You are obviously welcome to host any game servers on your PC. We do have servers available that allow for some games to be hosted by us, but the need must be warranted, i.e. more than 2 people playing a specific game. Food vendors will be located outside the Blue Wing area (by Entrance 3) and inside all three NAG LAN areas. These vendors will remain open 24/7 from Friday, 27 September. There will also be coffee stations in each NAG LAN area that will be open 24/7. There are take-out food vendors as well as restaurants located across the road in the Northgate Shopping Centre, but you will not be allowed to bring any of their food back into the venue, as this is a venue regulation. There are security guards posted around the venue for the entire weekend, both day and night. The safety of your equipment is however still your responsibility. So don’t leave your cell phone, iPod or camera lying on the table while you go for lunch or to the restroom. This will lead to unnecessary temptation. Take your mouse, headphones etc. with you when you leave, or ask a buddy to keep an eye on your stuff, or pack your loose items and peripherals into your bag, or make use of the locker facilities to store your valuables. No PC’s/laptops/consoles or monitors will be allowed to enter or leave the venue between 22h00 and 08h00 every day. This is for the safety of everyone’s equipment inside the venue. No smoking inside the venue is permitted even if you make use of electronic cigarettes. Demarcated smoking areas are made available outside of the venue. Please note that smoking inside the venue, including sneaking a few puffs in the toilets, will result in dire consequences. Yes, they will be given a Parent Pass on arrival which will allow them access to assist you. Should your parents wish to visit you in the NAG LAN over the course of the weekend or bring you any items you may have forgotten, please advise them to meet you at the NAG LAN registration desk in the area you are in, where they will then be provided with a Parent Pass wristband which will allow them to access the NAG LAN. You are more than welcome to bring your girlfriend/boyfriend/non-gender-binary-symbiote with you into the NAG LAN, however they do have to purchase a rAge Expo Weekend Pass ticket. Upon arrival at the LAN they will go to the NAG LAN registration desk with their weekend pass ticket where they will be issued with a wristband. This wristband will give them free access in and out of the LAN for the whole weekend. Please be aware however that there is no extra seating in the LAN. 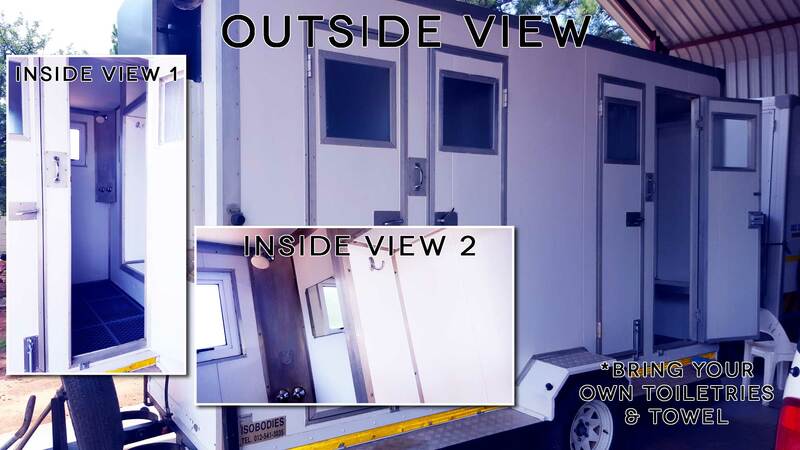 For those gamers without a Virgin membership we have a portable shower system (click this link for an image) that will be located on the bottom right of the Precinct Map (look for the pink block). All NAG LAN gamers are welcome to make use of this facility during day time hours only on Friday & Saturday (between 6am and 6pm) and on Sunday (between 6am and 2pm). The showers will be manned by a security guard during these times and will be locked outside of these hours. Please don’t forget to bring your own toiletries and towel with! Aruba and Duxbury are supplying the necessary network switches and equipment to run the ultra-slick and super-fast network. We like to keep the network specs under wraps to avoid undue stress of the eyes being exposed to too much awesomeness 😉 If the question is whether you will have a gigabit connection at your table, the answer is no since no game that we have come across exceeds the need of a 100Mbps connection. There is no off-loading area so you will need to park your car in the dedicated NAG LAN Parking Block A/B and bring your stuff from there. You will need to show your original Computicket ticket to the security guards on duty at the parking entrance to gain access, but DO NOT leave the security guard without getting your ticket back as you will need to present this ticket to us at the LAN Registration Desk. Please ask us to issue you with a Parking Pass before you leave the Registration desk as we will take your original Computicket ticket from you. Upon arrival at the venue please check your NAG LAN ticket and take note of which entrance you need to be at, as you won’t be able to check in at any other entrance other than the one that is stipulated on your ticket. The venue is a closed indoor building so once you’re inside you shouldn’t get wet. However, if you arrive and it’s raining we suggest bringing large plastic bags to cover your stuff while carrying it from the car park to the Registration Desk. Can I arrive on Thursday to start queuing? We love your energy, excitement, and enthusiasm to be first in the NAG LAN queue, but please remember that no gamers will be permitted onto the Ticketpro Dome premises before Thursday morning. Upon arrival on Thursday you will need to adhere to the queuing system that is in place to ensure that the gamers who arrive first, get in first when doors officially open. Please be sure to get a queuing ticket from our NAG LAN security guards. And please double check that you are in the correct queue according to what area it says on your ticket. Computicket will only offer refunds on NAG LAN tickets in accordance with their standard terms and conditions: If the cancellation occurs more than 30 days prior to the event a 15% cancellation fee will apply; If the cancellation occurs less than 30 but more than 7 days prior to the event a 50% cancellation fee will apply; If the cancellation occurs less than 7 days prior to the event a 100% cancellation fee will apply. Please contact Computicket directly should you wish to cancel your ticket. Tickets will be available to purchase at all Computicket outlets and online from 9am on Saturday 27 July 2019. Please remember that because Saturday has a very high attendance over the lunch time period, the Fire Chief has advised us that he may temporarily restrict/close access from the NAG LAN into the expo itself between 11:00 – 14:00. This is to ensure that Health & Safety regulations of the venue are adhered to and overcrowding is avoided. This decision will be made by the Fire Chief on site on Saturday once the capacity and attendance numbers over this time period have been assessed by the safety team. Please do be understanding and tolerant in this matter, as the safety of everyone inside the venue is of primary concern should an emergency arise and the venue needs to be evacuated. There are a limited number of lockers available for use in the LAN, where you can store valuables should you need to. You do need to bring your own lock, as locks will not be supplied by us. Standard sized locks are recommended. Lockers that have not been emptied out by 15h00 on Sunday when the LAN closes will be opened by security by cutting the locks, and all items found in there will be placed in the Lost & Found box. Please note that lockers are available on a first come, first serve basis. What happens if I leave something at the LAN? We do have a Lost and Found box and all items handed in to the organisers office or the LAN admin desk are placed in there after the LAN has closed. You can get in touch with us via email [info@naglan.co.za] with your contact details as well as a detailed description of the item/s you have misplaced/lost. No PCs/consoles/laptops will be allowed to be checked in between 22h00 – 08h00 on Friday or Saturday. No PCs/console/laptops will be allowed to leave the venue between 22h00 – 08h00 on Friday or Saturday so please plan accordingly. We will not allow port scanning and hacking into machines. If you do, you will be asked to leave the LAN. If you are unsure whether your software is allowed, please ask. Please ensure that you do not lose your access card (this is issued to you at the Registration Desk when you arrive), since you will need to wait till the end of the event (Sunday at 15h00) before you can leave so that we can verify equipment. Have your PC and monitor tested at the Power Test Station. Only two PCs/consoles/laptops per multiplug are allowed, in other words each person is allocated only two plug points. No drugs or alcohol are permitted. Red dedicated plugs are required. Please don’t unplug the power, and don’t force your plug – rather ask one of the admins for assistance. You may not use/bring your own multiplugs or network equipment, if unsure ask one of the VC admins. Do not share anything if you do not want it to be copied. Make sure your Shares are “Read only” if you need to share. Please take your keyboard, mouse, headphones, cellphone and wallet with you when you are leaving the venue. Please ensure that you PC/laptop has the latest service packs installed. Please ensure that you have some anti-virus software installed on your PC. A free Virus program will be available from the VC website. Please don’t leave open seats between gamers. They are going to fill up anyway and it might mean you will need to move a couple of seats during the event. If you experience any problems at the LAN, please let someone from VC know immediately so that we can address it and find a solution to the problem. If you do not give us the opportunity to rectify the problem, do not complain afterwards. Please do bring a sporting attitude with a desire to have fun. Should you buy computer equipment at the rAge expo itself, please check it in through our registration desk with your receipt and we will give you additional security stickers. Step 2 – We will ask you to plug a power cord into your PC/console and switch it on. If it starts to boot without tripping the power, you may switch it off. For laptops we will only test the PSU. The reason for testing is to ensure that nothing went wrong with your PC or monitor whilst travelling. We request that you power your devices yourself; to ensure that we do not stray from your diligent proven sequence that reduces hardware failures. Step 4 – Take your gaming rig and equipment to the next station and present your NAG LAN Computicket ticket. Step 5 – You will then be given a NAG LAN wrist band as well as an access card and five numbered stickers. The stickers must go on every item of your gaming rig (instructions are on the bottom of the sticker). Do not lose, drop or throw your access card away as this will allow someone to leave the venue with your equipment.  If you do lose or misplace your access card you will need to stay until 15h00 on Sunday before you and your equipment will be checked out of the LAN. Do not remove your wrist band as without it you will not be given access to either the LAN or rAge Expo. Step 6 – Find a seat, first come first serve. You may hold an open seat next to you for your friend that might be arriving a little later, but do take note that as the LAN fills up, someone might come and take the seat that you are keeping. We do ask that you try and resolve this in an amicable and friendly manner. Should they not wish to comply with your request, its first come first serve. Step 7 – Plug in your PC/console/laptop and monitor and peripherals. Each multiplug only supports two PC’s/console’s/laptops so ensure that you keep to this so that you do not cause a power failure. Remember only half the table is yours, so plan accordingly. Should you be sitting at the end of a row it is recommended that your PC case goes on the floor underneath your table. The smaller center tables are off limits as they are used for running cables and for switches so please don’t put anything on them. Step 8 – DHCP addresses are assigned and you should be good to go. Step 9 – Have fun and remember that you can ask an admin for assistance at any time. All PCs and consoles will need to go through an authentication process once you have setup your rig, plugged in your network cable and powered up. 8. Enter the code. If successful you should now be able to enjoy the internet in the NAG LAN. 6. Bring down your cursor on “Advanced Settings”, “Host Name“, “Alternate MAC Address” and select it. 7. The MAC Address for your Xbox is displayed on the left side of the screen in a format like 12AB34CD56EF. When you go to provide this information in another system, you may have to type it in the normal format of 12:AB:34:CD:56:EF. Select “Done” when you’re finished. What if I still have a question about the NAG LAN that hasn’t been answered here? You can email us info@naglan.co.za or you can join the NAG discord and chat to us directly.